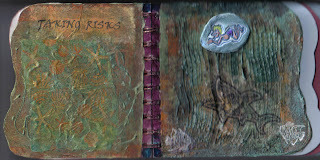 This is page 4 in my board book titled Creativity, which I am doing with the Yahoo group, AB Canada. This page is a fun one, lots of texture, tissue and paints. Left side, I squirted on some threads of dimensional paint, two layers of different sections of the same tissue; gel medium, and finally a coat of liquid laminate. I then brushed on some blue green Pearl X when the laminate was still wet, and Perfect Pearls Kiwi. Right side, I put molding paste on the page, ran a texture comb through it in a wavy design…let dry. Glued another tissue on top, stamped big fish on tissue and glued down. Stamped little fish with white ink, and lightly painted tops of page ridges with metallic paints. The diving boy is made with air-dry clay and painted with markers and rub-ons. Taking a risk, isn’t he? !